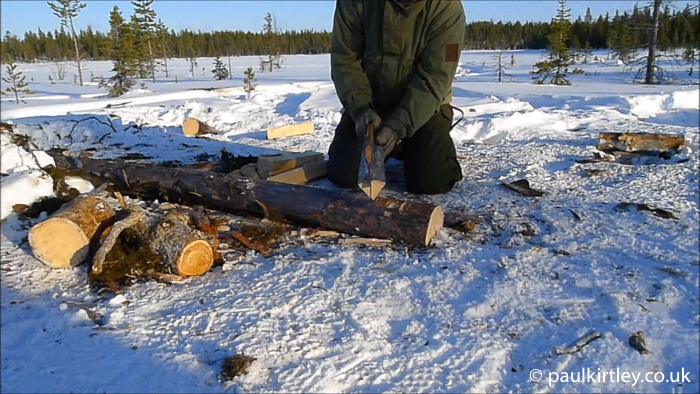 The axe is an important tool of winter bushcraft. Indeed, it is one of the most critical pieces of equipment for winter forest camping. You need more fuel in winter just to stay warm and the nights are longer, so you need to keep your stove or fire burning for extended periods. The flip side of this is that days are short, giving you less time to source and process firewood as well as other aspects of your trip. The same goes for building shelters. There is much to do and little daylight to complete the tasks. Speed and efficiency with your axe in winter is important. But so is maintaining safety. A hot tent camp. Note the firewood processing area bottom right – only possible with an axe. Photo: Paul Kirtley. This lean-to shelter and the long-log fire in front of it, all depended on quick, efficient and safe use of an axe. Photo: Paul Kirtley. In cold conditions, you are likely to be using gloves, or even mittens. 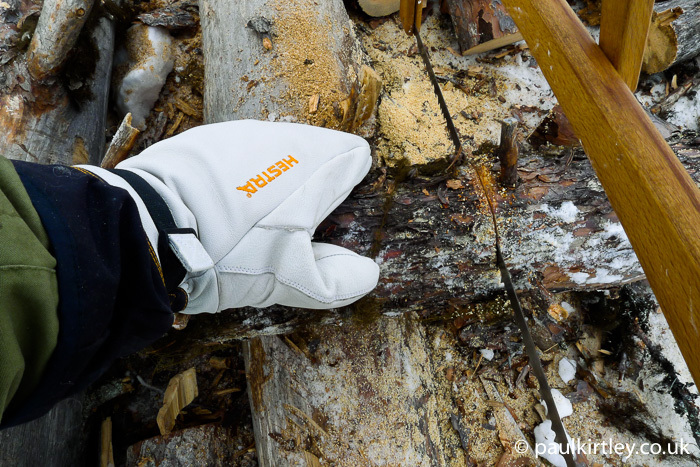 Handwear changes the nature of the contact between you and your axe. Your hands – when warm – are naturally very sensitive. There is an easily-achieved feedback loop which allows you to hold an axe firmly enough so it doesn’t slip out of your hands yet loosely enough so that the handle can slip through your hand as you swing the axe or your wrist does not become too rigid while chopping. 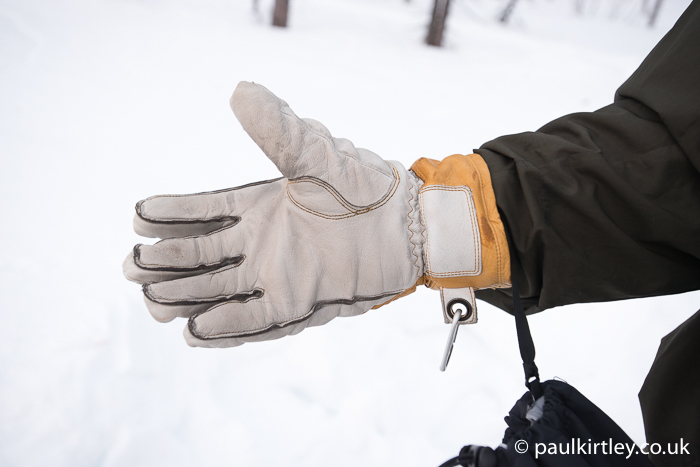 Insulated leather finger gloves are ideal for winter axe use but still be mindful of ice reducing grip on fingers or palm. Photo: Paul Kirtley. When you are wearing gloves, particularly lined gloves, there is a loss of sensitivity to the precise level of contact and adhesion between the axe handle and your hand. Add to this the potential for cold hands in cold conditions, and it is clear we need to mindful of the level of not just our level of grip on the axe but also what may be affecting our ability to sense the level of grip. The surface of the handwear is important too. If I have to wear gloves while using an axe, I have a strong preference for leather work gloves or insulated leather finger gloves. As long as I am warm enough bodily to start with, I find I can use my insulated finger gloves for pretty much any axe task, even in low temperatures. 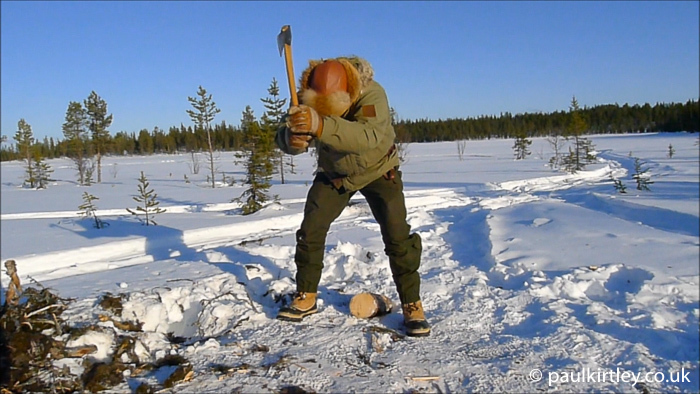 While I might undertake some sawing or simple splitting techniques while wearing mittens, I have a strong dislike of wearing mittens of any type while applying any axe technique which involves significant speed and momentum. I much prefer to wear insulated finger gloves. Dynamic splitting techniques tend to warm you up anyway, so switching to finger gloves from mittens in this case, avoids putting sweat into your mittens. Sawing firewood while wearing mittens. Photo: Paul Kirtley. While we are on the subject of handwear choice, we should also take a minute to consider the material of the axe handle. Even if two materials are at the same low temperature, the conductivity of the material matters to both how cold the material feels as well as how much cooling effect it will have on your hands, even if you are wearing gloves. 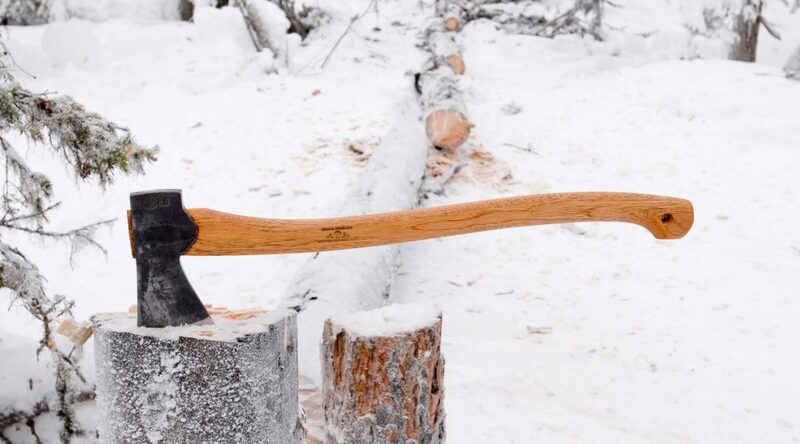 Wood is a relatively low conductivity material and preferred for axe handles in cold conditions. Finally, even with good handwear that is suited to axe use in cold conditions, you should be aware that icing on the palms or fingers can cause a reduction in grip on the axe handle. In recent years half-length axes have become popular, particular in bushcraft circles. With a length of around 50 cm (19”) and a weight of just less than a kilo (around 2lbs), these axes are eminently portable, easily strapped to the outside of a pack, or even carried inside a day pack. These short, light axes are wieldy and particularly suited to some splitting techniques – see below for the “between the legs” technique but they do lack weight and leverage compared to larger axes. While a half-length axe is sufficient to fell and process dead-standing trees for long-log fires or hot-tent stove use, my view is that a larger axe is preferable for serious winter applications. The extra momentum and “chop” of a heavier head, combined with the increased leverage of a longer handle provide advantages in the winter forest environment, particularly the boreal forest. Half-length axe on the left, three-quarter length axe on the right. Photo: Paul Kirtley. In the boreal forest, trees grow slowly. The growing season is shorter and the winters are harder. These factors manifest themselves in small, tightly packed growth rings within the trees, compared to their cousins growing in more southerly latitudes. This makes the wood, even the dead wood, very tough, certainly tougher than your experience in more temperate climates would lead you to expect. Wood that is tough to fell, tough to section and tough to split demands a more efficient tool, particularly if you have limited time in which to complete the job. 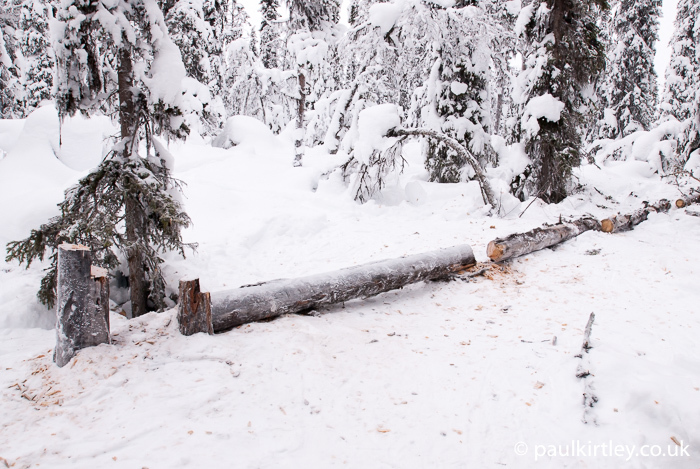 Wood in the boreal forest tends to be tough to fell and tough to split. Photo: Paul Kirtley. Gnarly dead pine in the boreal forest, felled for firewood. Photo: Paul Kirtley. 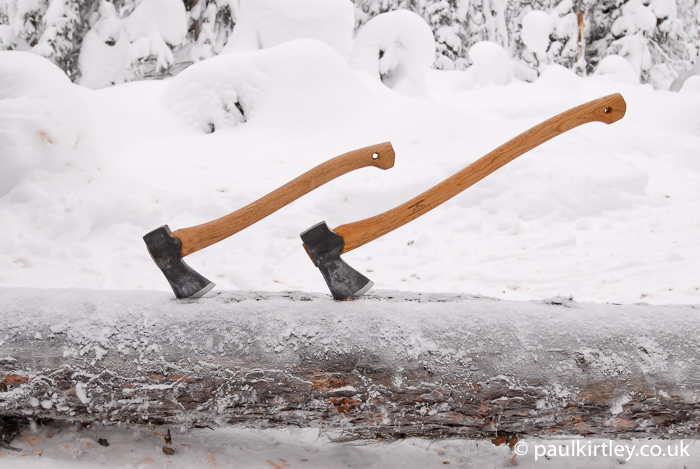 For winter use, particularly in the boreal, I prefer to use a three-quarter length axe. This size axe is like a scaled up version of the half-length axe, weighing about 30% more at 1.2 Kg (2.6lb) and with an increased handle length taking it to about 64 cm (25”) in length. On paper these numbers don’t fully represent how different this axe feels in use compared to the half-length axe. It has significantly more swing and bite for both felling and sectioning. In addition, the longer handle affords more reach for limbing. Some prefer a heavier axe still, particularly if the bulk of what they are doing is splitting fire wood. Personally, though, the three-quarter length as described not only provides the weight and leverage I need for taking larger wood for fires but also still wieldy enough for cutting poles for tents or natural shelters as well as splitting finer kindling. Felling, limbing and sectioning in winter require efficiency. Photo: Paul Kirtley. 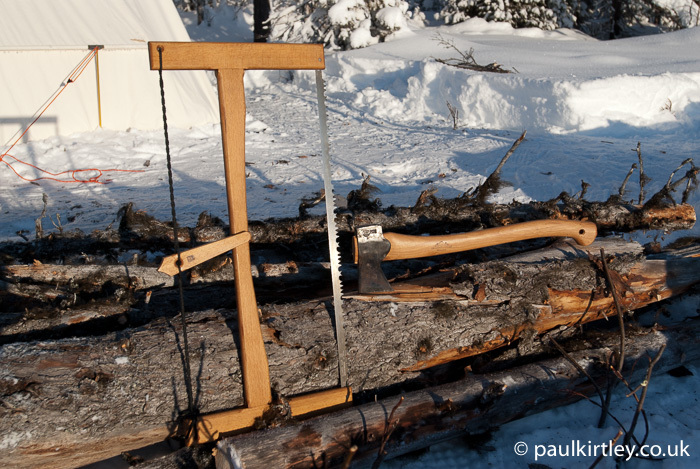 A three-quarter length axe has clear advantages for winter forest use. 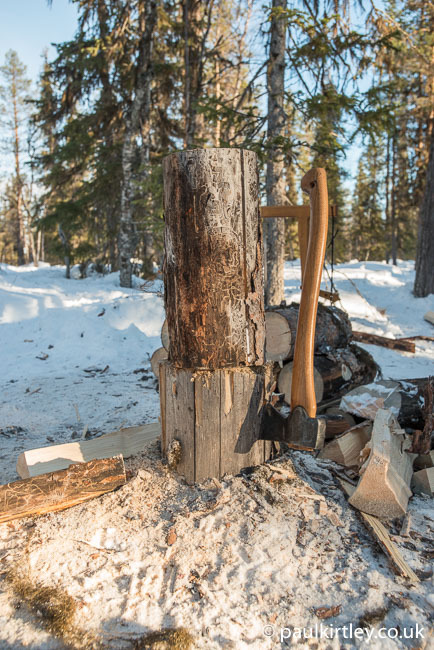 Even so, if you are used to using a smaller axe in warmer climes, you should make sure you familiarise yourself with the weight and feel of the heavier axe so you can use it efficiently and safely in the cold. In particular the increased length of the handle will alter the strike point of the axe bit by 15 cm (6”). This will mean having to change your body position for many jobs. Moreover, some techniques will have to be modified significantly or discounted. As already mentioned, the “between the legs” splitting technique works well with a half-length axe but is not possible with a three-quarter length axe. An axe is one half of a powerful partnership when paired with a saw. 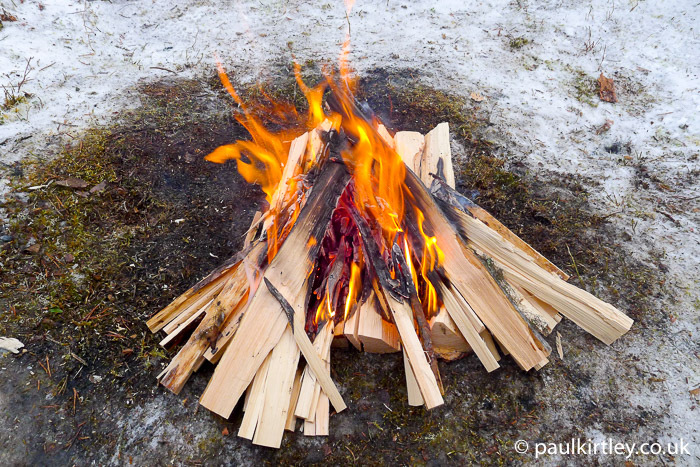 This partnering comes into its own in winter, when you require plenty of firewood for your fire or for your stove. Whether you are carrying a half-length axe or a three-quarter length axe, you should be carrying a full-length saw. By full length I mean a 24 inch blade. Axe and saw form a powerful partnership. Photo: Paul Kirtley. My preference is for a folding, wooden-framed saw, a folding bucksaw. Folding means it packs easily. Wooden means it is not as heat-sapping in the hand as a steel or aluminium-framed saw. Saws are much more efficient in cutting across the grain of wood than axes. They also wasted less material. Sawing wood allows you to create rounds of wood the correct length for your stove. Logs with flat ends are also easier to split. The axe and saw work so well together. Firewood sawn to length, with minimum wastage, ready for splitting. Efficient tools and their use are key. Days are short. Photo: Paul Kirtley. Working with an axe on snow is different to working with an axe on solid ground. The first thing to remember is that snow is not the ground. Even firmly compacted snow with a crusty surface will not stop an axe in the same way earth will. The first adjustment you need to make, then, is a mental one. If you have been using an axe for a while, you have an unconscious piece of mental programming, which is trusting – at least somewhat – the ground will stop an axe. It’s easy, and hazardous, for this assumption to carry over to snow. The second aspect to working on snow, particularly away from camp, is getting around on the snow. In any significant depth of snow, you’ll need to be moving around on snowshoes or skis in order to make any progress. The uninitiated might think that once you find your source of firewood, you just take off your rackets or planks and get to work with your axe. Now, while I’m not saying this is never the case, particularly with respect to skis, it’s not as easy as it sounds getting on and off snowshoes or skis in deep, powdery snow. Nor is it then easy to move on foot, in deep snow, around a site where you are felling, limbing and sectioning a tree. 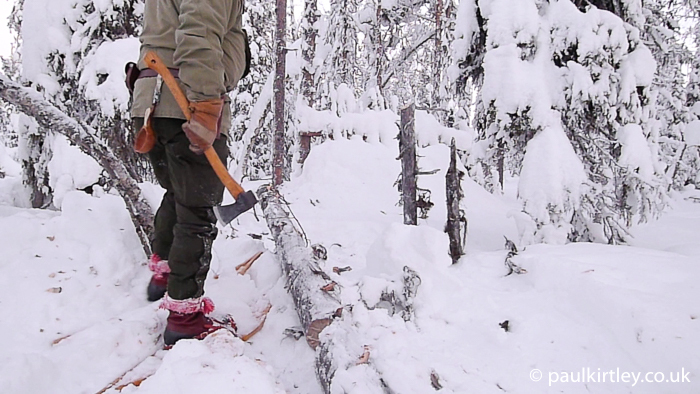 Snowshoes provide an excellent platform on which to work in the forest in winter, including using an axe. Photo: Paul Kirtley. Especially when wearing snowshoes, more often than not you’ll be working from whatever weight-spreading platforms are attached to your feet. So, you need to get used to working with your axe with your snow shoes on your feet. This has a couple of implications. The first – depending on the design of your snow shoe – is how close you can approach an object straight-on before standing on it. The second is that the upturned front of a snowshoe can provide an object on which the axe will catch when swung. It’s an object that is not usually there and, if buried a little in powdery snow, can be hard to notice. Working from snowshoes in full winter conditions. The snow under my feet was waist deep. Photo: Paul Kirtley. Snowshoes provide a pretty stable base but snow can shift and compress over time as you work with an axe. It’s best to trample the snow first to provide the most stable base possible to begin with. Just as you would clear the area around the base of a tree you plan to fell in warmer woods, removing trip hazards, obstacles and the like, prepare your footing around the tree in winter by compacting the snow. Similarly, once the tree is felled, spend a short time trampling the snow in the area where you are going to work from. This has the added benefit of exposing more of the trunk, which may be embedded in the soft snow. 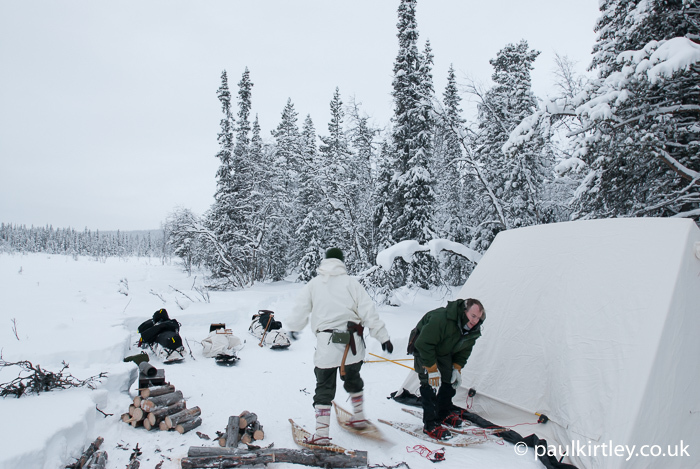 When you compress an area of snow on which to place your heated tent, it is worthwhile compressing an additional area adjacent to the tent to allow space for a firewood processing area. A firewood storage and processing area on a winter camp. Photo: Paul Kirtley. 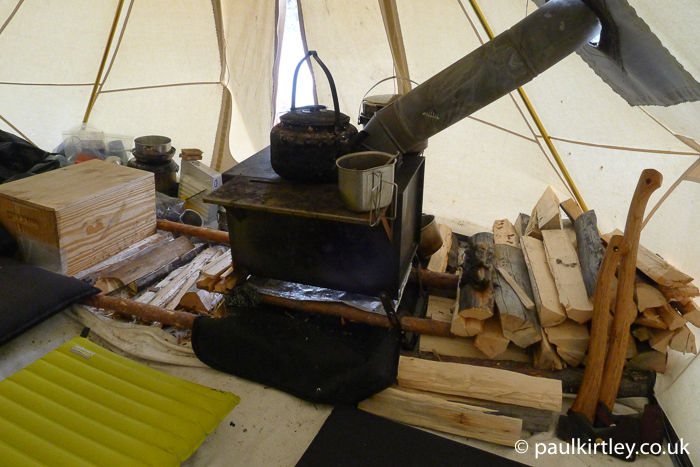 I’ve already mentioned the value of creating a firewood processing area near a hot-tent camp. It’s just a case of extending the area you trample with your snowshoes. It will take a little while to freeze though and this is one of the first things you should do once you have chosen your camping spot. While the platform is solidifying, you can then source some firewood in the forest as well as any poles you may need for the tent. 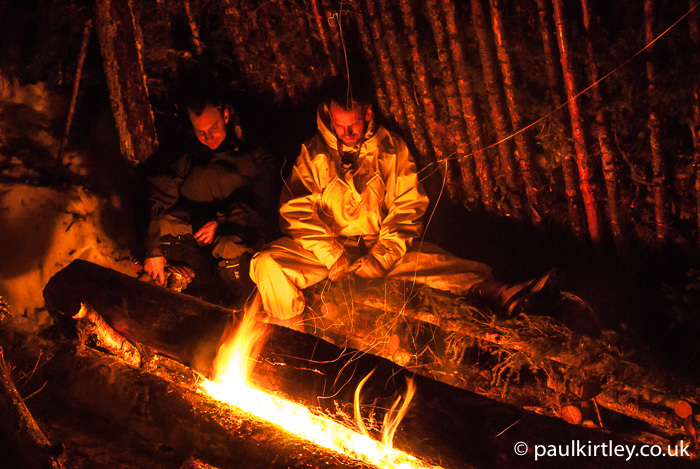 Thinking about the order you do things when setting up camp speeds up the process dramatically. Erecting the tent on the frozen snow platform. 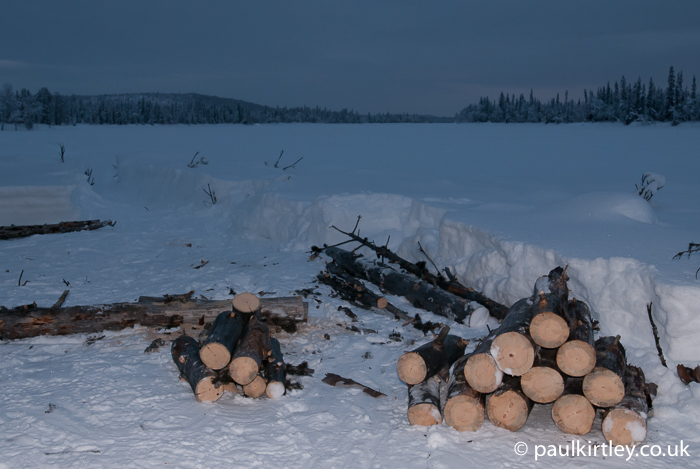 Note we have already sourced and process the initial firewood we need, while the platform was freezing. This means as soon as the tent is up, we can light the stove, start warming the tent, melting snow, making drinks and defrosting food. Photo: Paul Kirtley. Get organised inside your tent as well as outside. Have a place for everything and everything in its place. Photo: Paul Kirtley. 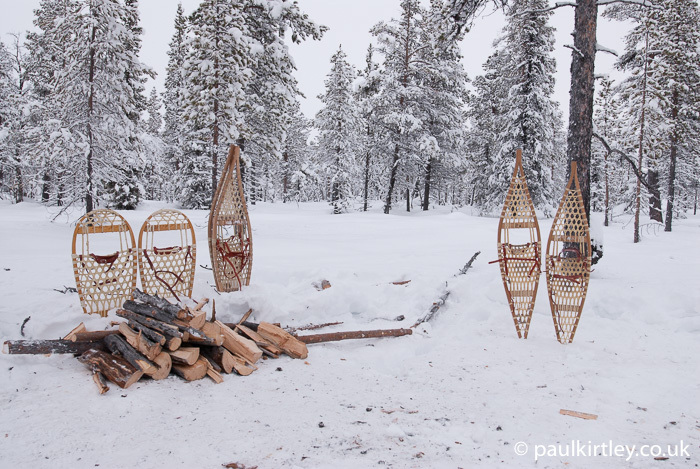 If it’s cold enough and you first thoroughly trample the snow with snowshoes, the snow will form a hard crust, firm and solid enough for you to walk on without snow shoes. This forms a good base on which to work near to your camp. But again remember the snow is not as solid as the ground. An axe will cut through it like butter. Similarly, compacted snow is never hard enough to apply downward force when splitting. You cannot use vertical splitting techniques directly onto the snow. The force will punch holes through the crust into the soft snow below. You can, however, use horizontal splitting techniques, which rely on the inertia of the log combined with speed and accuracy with the axe. The between-the-legs technique and the side technique are effective but they are also hazardous if applied incorrectly. The between-the-legs technique utilising a half-length axe, depends on intertia of the log combined with speed and accuracy with the axe. Photo: Paul Kirtley. NB this technique is potentially hazardous if applied incorrectly. Please watch the video elsewhere on this site to see the important safety points. Photo: Paul Kirtley. 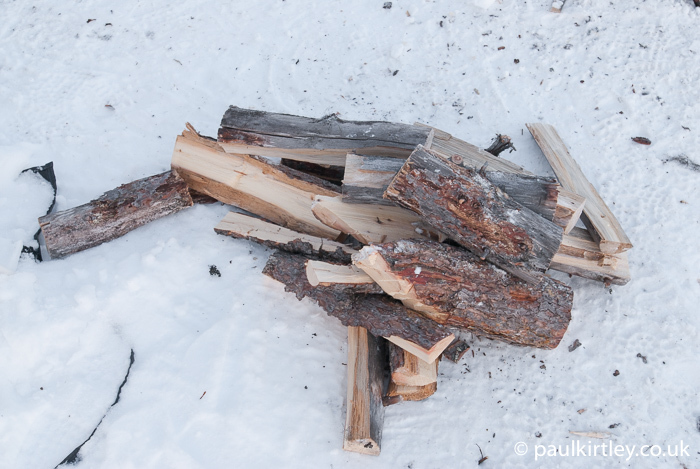 Learn more about safely applying this method of splitting firewood on snow here. Kneeling while felling, not only makes this inherently safer, particularly with a shorter axe but also allows you to harvest more material by cutting lower down. Photo: Paul Kirtley. Just as is the case in summer, when using shorter axes, kneeling is a way of making the axe much safer. 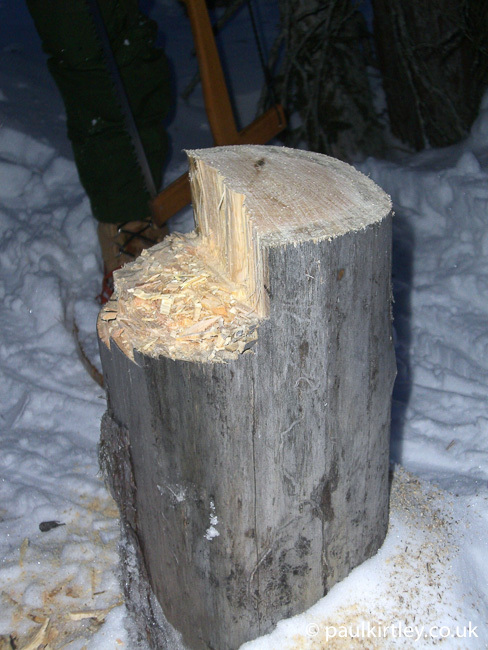 Placing a log horizontally on top of the encrusted snow will allow you to split smaller pieces of wood as per the techniques I described in this article on everyday splitting techniques. This is worthwhile to efficiently produce all the sizes of kindling and small fuel you need for your stove. 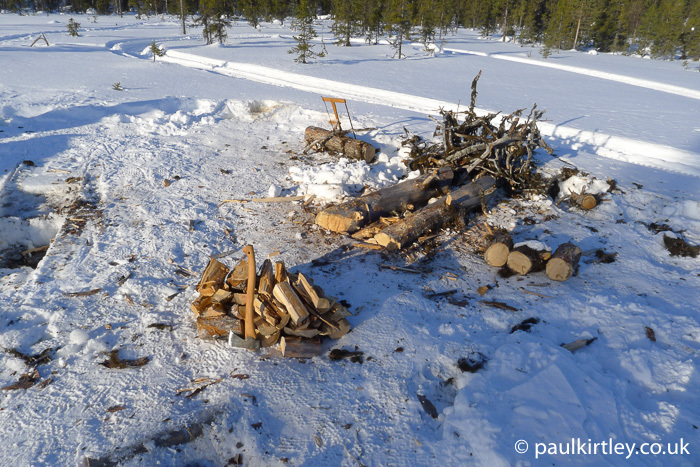 Creating a small-fuel splitting station with a horizontal log on top of the frozen, compacted snow. Photo: Paul Kirtley. 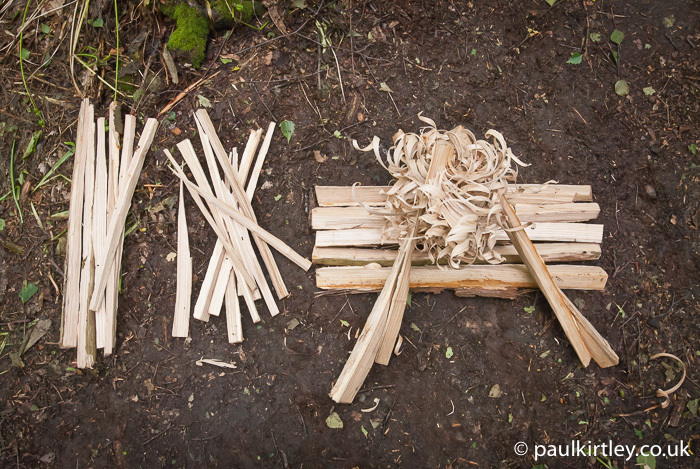 Kindling and other fuel sizes stacked near to the stove ready to be used. Photo: Paul Kirtley. Sometimes you are lucky enough to have fuel very close to your camp and the stump of the felled tree can be used as a small chopping block. 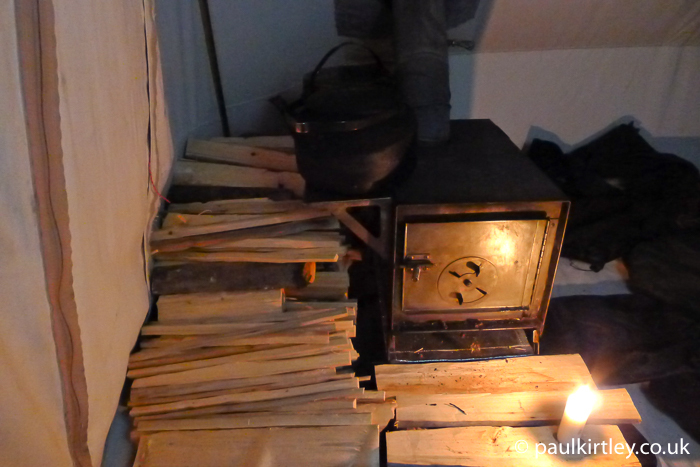 Indeed in terms of building a shelter which relied on plenty of firewood for warmth to survive the night, I choose a spot which has both the shelter materials and the fuel very close to hand. Using the stump of a felled tree as a chopping block. Photo: Paul Kirtley. To use a stump as a chopping block, you first need to saw horizontally so you have a flat surface on which to work. Also bear in mind the stump will not last a particularly long time before splitting itself. But if you are in the area only for a day or two, it should last long enough before you obliterate it. Splitting kindling on the stump of the tree the wood came from. Photo: Paul Kirtley. In all of this do not forget the basics of using your axe safely. From felling to splitting kindling there are mistakes to avoid. Yes, there are some added complications when operating in cold environments but the basics are the same. Don’t let these get lost in enthusiasm for a new environment or camping out in winter conditions for the first time. 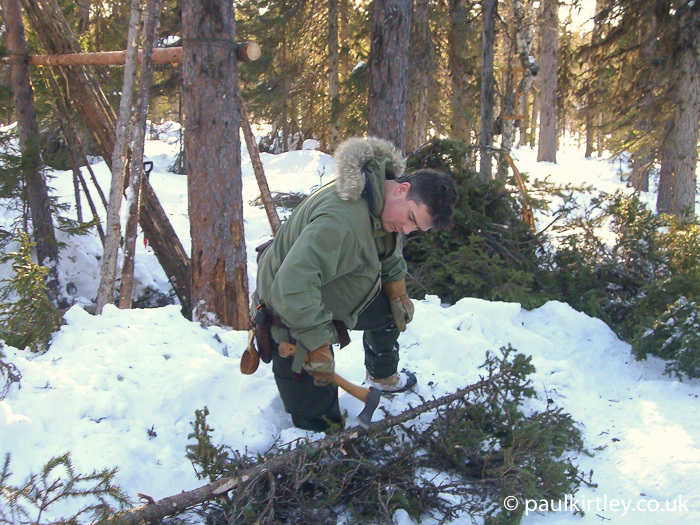 Stripping small branches from spruce trees for a lean-to shelter. I’m working off to the side, the tree is between me and the axe and the follow through with the axe is behind me. Working on snow does not remove the need to adhere to the basics. Photo: Stuart Wittke. 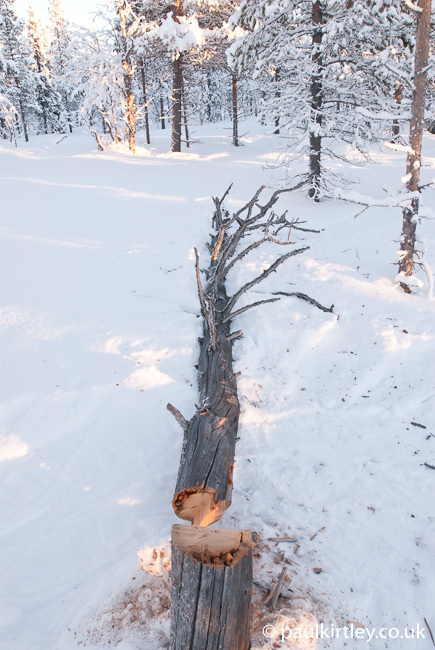 Tree felling in the boreal – front cut with axe, back cut with saw, creating a hinge with a backstop. This is the same methodology as I use to fell trees outside of this environment. Again, remember the basics. Photo: Paul Kirtley. 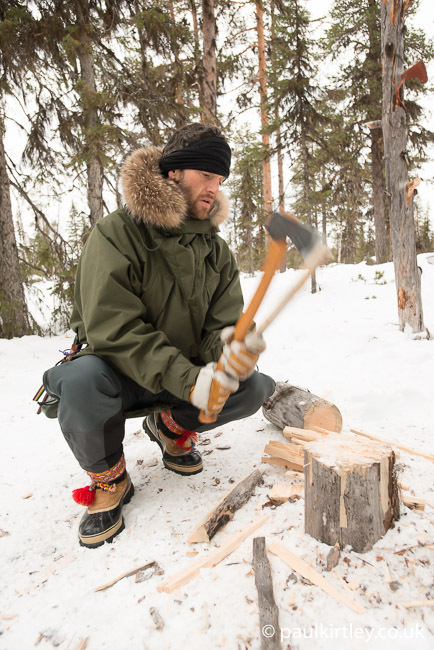 Elsewhere on this blog, there is a detailed piece on axe safety around camp, which includes many of the basic techniques on which you will need to rely directly, or build upon, for proficient axe use on a winter camping trip. If you haven’t read the article, then I would recommend clicking on the link and reading through these foundational safety points. 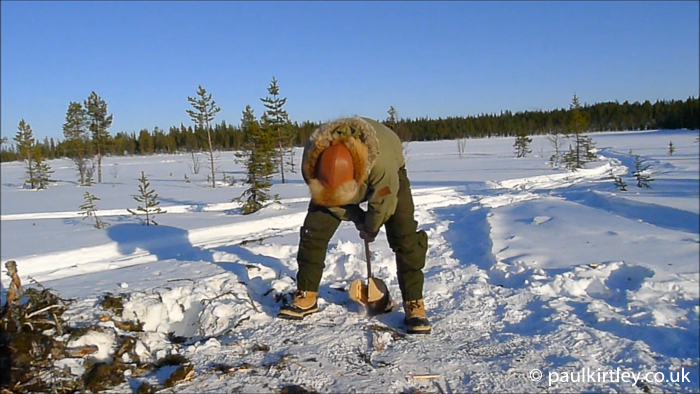 Pretty much everything you do in winter with an axe is an extension or modification of what you might do in summer. Moreover, in summer, you will have more time to complete a task. You have more hours of daylight and there is less pressure on you from the cold. Faffing around in cold conditions is how you get cold in your body, cold in your hands and can lead directly to cold injuries. Train the faff and inefficiency out of your techniques by practicing closer to home in the warmer months of the year. This approach can also apply to knife skills and fire skills, particularly if these skills are all linked. 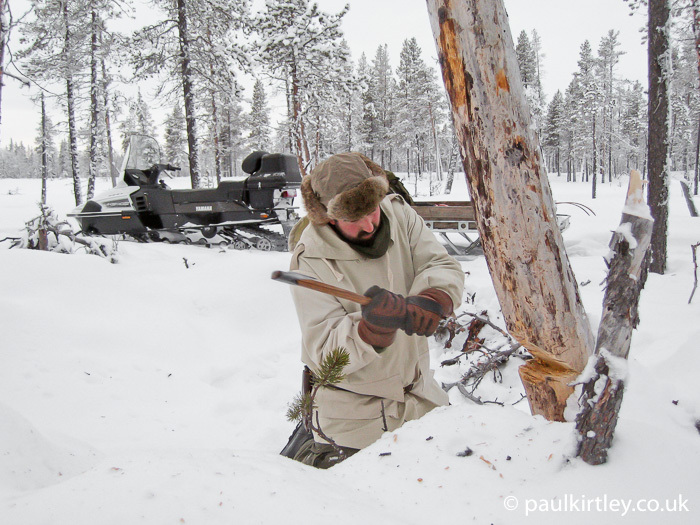 For example splitting wood down into splints, making feathersticks and lighting them with a ferro rod is a process you can practise over and over closer to home then apply with proficiency in colder conditions when you really need it to work. Skills training closer to home during the summer months. Photo: Paul Kirtley. Application in the northern forest in winter. Photo: Paul Kirtley. Thank you for all the detailed effort you put into your articles. Very appreciated! I liked the emphasis on safety / safe techniques which are important for anyone, but particularly for novices. Great photography clearly illustrating the narrative. Thank you Paul. You know, maybe it’s because I’m sitting in a bit of an echo chamber but it seems to me that the push is now going towards larger folding saws like the silky big boy or the silky 310 over axes. In particular, I watch a YouTube channel entitled survival Russia by a gentleman living in Siberia. He has been very vocal about saws versus axes and has reduced the role of the axe to a very miniscule amount of time as compared to what it currently is thought about. He routinely makes large, and buy large I mean 8 to 12in diameter, log fires with just a small Silky saw. He also makes obscenely large fires with logs in excess of 30 cm. Aside from the safety concerns, he mentions that he’s able to do this with much less weight. I was wondering if you could offer your thoughts on this, folding saws versus axes. Hi Ken, larger saws do have their place and I have arboriculturist friends who find them invaluable for certain jobs. There is, however, with that type of saw a risk of breaking the blade if it pinches. I have seen this happen and have heard of several other intances. They certainly were not in the hands of clueless novices. Second point is that it is often difficult to fell larger trees that are with a hand saw alone. Third – True you can saw large diameter logs for long log fires but you can’t split logs for stoves with them. Stoves are much more efficient in fuel use than open fires. The latter is an environmental consideration as well as a practical one. I think there is a solid place for the axe in boreal bushcraft in particular but I would also agree that overuse of an axe only increases risk of injury as well as expending energy unnecessarily. Hope this gives some idea of my thinking on the matter. Yes it does. Thank you very much. In my environment the snow is often wet to crush with snowshoes and I find myself working on wet ground.. very bad!!! Hi Paul, I do not agree with you how to drop trees. The technology advocated should be avoided in case of misjudgment, there is no control over the fall of the tree, etc. JC, I would be interested to hear your views too. Any chance of replying here? Hi Mick! A complete thorough review of tree felling is not possible here, even if I would like to. You need plenty of text and some photos to cover this. and I forgot to say that, Mick, if I get your Contact information I will give your information. Hi Paul, thanks for the interesting article. You talked about your dislike for wearing mittens when using an axe when involves significant speed and momentum. I was wondering if you could explain why? I’ve used mittens (choppers is the local term) for 40 years in the boreal forest of North America and have never had a problem. These are leather mittens which fit rather loosely so ones hand is able to function as a hand inside the outer skin. I would not use a synthetic mitt or an overstuffed one. Just my 2 cents. Thanks again. Excellent content as always sir! Thanks for the interesting article, I never put much thought into the handle materials for saws and axes before. Wood is definitely going to be warmer material to hold in your hand verses plastic or aluminum. I wear waterproofed leather ‘roper’ gloves for wood splitting and cooking duties and wear mittens when I need the warmth and am not working. Great article. Appreciate the detail and photos! Great article! 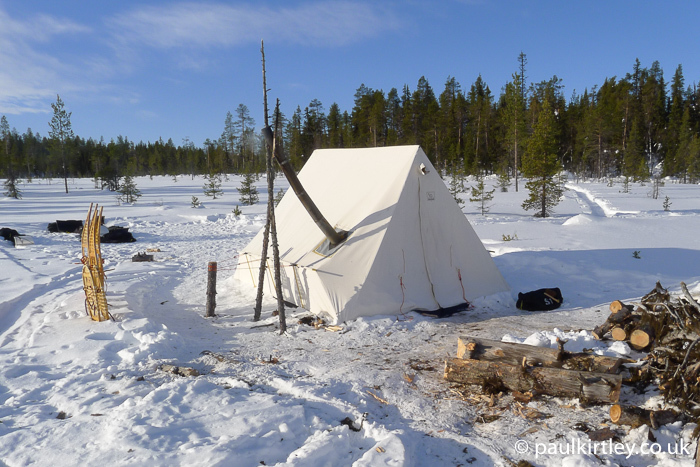 I’m planning to take a winter bushcraft trip to northern Sweden next year and wondered what the law/rules are around felling dead standing wood in the forest there? Not having been in this environment I wondered if windfall is an option? I wondered if the possibility of it being wet and frozen is a deterrent from opting to risk the effort? Sorry it doesn’t seem clear to me having only collected firewood in a temperatures as low as just above freezing point it’s still easy to check the wood for soundness. I have both the short “19 and very recently (probably the last available in the UK) “25 GB axes after reading your blogs. I’d like to see them put to use outside of work purposes but admit I’d like to learn more first as these sorts of questions come to mind regularly. Cheers for the excellent blog entry. I for one really do appreciate the effort you put into these as I think they have a lot of detail that might be missed in a podcast for example. Thanks for your suggestion. Duly noted. I’ve added the idea to my “future article/video” list. Hi Paul. Great article. I do axe safety training at our Scout group and I’m pleased to see I’m following the important guidelines and every bit of extra knowledge is helpful. Thank you for continuing to offer these useful articles. Best wishes, Bruce. Hi Bruce, thanks for your feedback on this article. I’m glad my axe articles are providing good confirmation of what you are teaching to your Scouts.